I saw my first calochortus in flower before I had even heard of it. It was a mind blowing experience introduced to us by the late Wayne Roderick, our guide to the 1995 AGS tour of the Sierra Nevada and White Mountains, and one of the greatest experts on the Alpine bulbs of California. He seemed to know where every bulb had ever bloomed and took us to see a wonderful variety, all of which were interesting, and most of them stunningly beautiful. 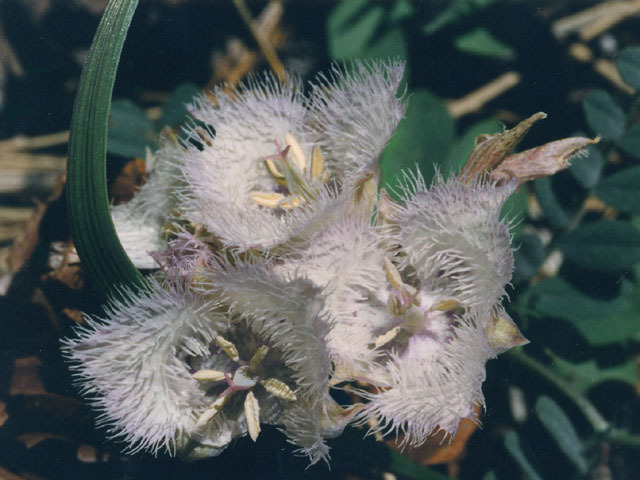 The one which really bowled me over was Calochortus tolmiei - a tiny Cats Ears species, bluish white and only 6 or 7 cm high, its inner petals almost filled with hairs. It was growing in the low scrub undergrowth of an open high pine forest, but is widespread in a variety of soils and elevations from Washington south to California. I have grown C. tolmiei satisfactorily in a cold frame, but without coming anywhere close to replicating the impact of my first sighting. In any case c. tolmiei is difficult to obtain and difficult to grow well. Calochortus caeruleus, (coeruleus in U.S. spelling), is very similar but much easier both to grow and obtain. The picture on the right is of my present plant taken last spring. C. elegans is also a close relative. 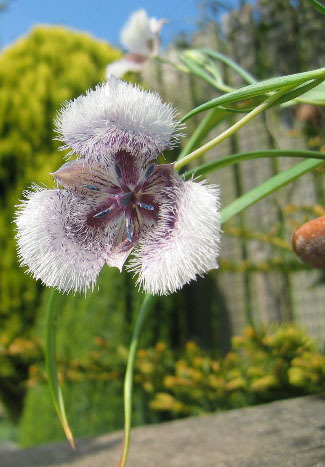 Other calochortus I have grown are C. uniflorus, compact, easy and excellent outdoors; C. albus with lovely globe shaped white flowers, a bit taller but also amenable in cultivation: C. venustus for the cold frame, a bit lanky but sumptuous grey/white with purple markings. Others have not yet produced flowers, but hopefully will give me at least one glimpse of their charm, before they too die of home sickness.